The accounting template provides a simple TyBase database for tracking account activity, quotes, purchases, and salaries. It provides the general functionality required for a home or small business, and forms a starting point from which you can customise an accounting system for your home, or for a client’s specific requirements. Disclaimer: Please note that as a generic solution, this template does not necessarily follow any accounting rules or requirements specific to your industry or country. If you are under a legal requirement to follow specific accounting practices, please ensure that the template is customised to correctly suit those practices. 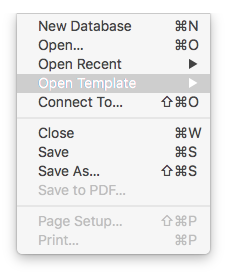 Templates can be access through the TyBase File menu “Open Template” command. Opening a template creates a new database which you can save locally. Your edits do not modify the built-in template. The templates are free for you to learn from, edit, customise, break, fix, rework, or just use as is. You may copy and paste the techniques, scripts, calculations, etc. into your own database.